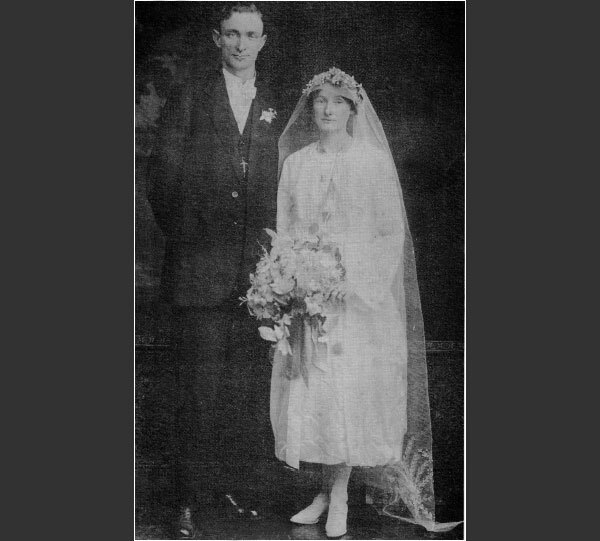 James Henry Punch and his wife Mary Kate (Polly) were married about 1920 - she being a sister of Mr Carlo Wilkins of "The White Swan" Hotel in Swan Hill and Mrs Nan Barwick of "The Royal Hotel" in Swan Hill. In 1923 they bought the Ultima Railway Hotel, but soon afterwards it was destroyed by fire, along with all their possessions. Two daughters, Mona Beatrice ("Peter") and Sheila Patricia ("Pat") had been born by then, but son Michael Wilkins was born later, when they were in the new building. A younger son, Billy, died in infancy. Sadly, Polly Punch died in 1932, leaving her young family to be reared by their father and other family members. Mr Punch thought it would benefit the girls to go to boarding school, so off they went to "Mary's Mount" Catholic Girls School in Ballarat, for seven years. Later, Mick was enrolled at "St. Pat's" in Ballarat, but three weeks later he demanded to come home!! He boasts proudly that while there, he sang in the school Choir at the famous "South Street" competitions!! He then went to "St. Mary's" in Swan Hill, to Intermediate level, staying with his cousins, the family of Jack and Nell Wilkins in McCallum Street. Later he worked for the Swan Hill Post Office. Mick joined the Air Force during war and like many others, could fly a plane before could drive a car. treated as "one of the family". She became a nurse and was employed at the Swan Hill Hospital, until her marriage to Max McNamara, a tailor with "Phil Jamaieson's Menswear" at that time - 1947-48. This shop is now Tom Wilkins' Menswear. "Mrs J" as as she was affectionately known to all who knew her, was a "Mother" to the many railway workers, and others - many of them homeless men - who had their meals at the hotel - and good wholesome old-fashioned meals they were! She was joined on the staff in 1935, by Mrs Kit Martin (Ross), who lived in Ultima. "Mrs J" suffered a stroke about 1952, and was forced to retire, and went to live with Molly, but Mrs Martin carried on as chef until the Punch family sold the hotel in 1973 - 38 years of service!! During the war "Peter" Punch married a U.S. Serviceman, Ted Beringer, who was stationed at the Catalina Flying Base at Lake Boga. Pat also met Bill Costigan at this time - also an Air Force member at Boga. Bill came from Mudgee N.S.W, and Pat told people "I married him on one condition - that he would never ask me to leave Ultima!!" Their marriage was arranged quickly after Bill received news that he was to be "Posted" North, in 1945. Pat borrowed a wedding dress and veil, and they were married in Ultima, with a reception at the hotel afterwards; and as she recalled "The B....icing wasn't even set on the wedding cake when we cut it!!". Pat went as far as Sydney with Bill and while enjoying their 2 days' honeymoon there, the war ended. They lived privately in Ultima until "Mrs J's" illness, when they moved to the hotel, with their 2 small children, Jenny and Jim, and stayed there until the hotel was sold in 1973. Maureen was born during this time. Jenny (Eyles), Jim and Maureen (Kennon) all still live in the area with their families. Mr Punch died in 1963. "Peter" moved to Billings, Montana, U.S.A. after the war, to join her husband Ted, and re-unite him with baby daughter Marilyn. They have made a few visits home over the years, as have their family of 5. Most of the "Punch Clan" have also made trips to Billings over the years. Jim Beringer, the eldest son of "Peter" and Ted, had a Music Business in South Melbourne, with his wife Rose, for several years. After the war, Mick returned to help his father with the hotel and in 1947 married local girl Eila Donohue. They lived privately near the hotel, and moved to Warrnambool, when the hotel was sold, to retire. Most of their family also now live there now. Bill Costigan kept his promise not to take Pat away for Ultima. They bought the home of Eila and Mick, after they had left for Warrnambool, and took an active part in events in the town over the next few years, Bill died in 1980, aged 63; Pat lived another 2 years after that, and died in 1982 at the age of 60. "Peter" Beringer had her 70th birthday in the U.S.A. in 1991. Mick and his wife Eila travelled to Billings to help her celebrate. This was a happy reunion of the last surviving children of James and Polly Punch.